In early 2013 RPC moved from its premises of 6 years into a new custom designed facility conveniently located at 42 Railway Parade Welshpool doubling its capacity and capability with 4500 m2 of custom built Blast and Paint facilities under one roof. 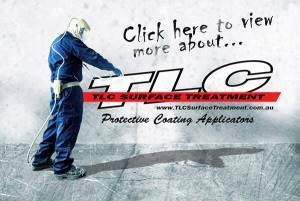 At the same time RPC Surface Treatment was rebranded as TLC Surface Treatment bringing it under the umbrella of its parent company, TLC (The Lifting Company). At TLC Surface Treatment, we have over 30 years’ experience and knowledge to safely carry out all of your sandblasting and industrial spray painting to Specification Requirements.